Across northern Europe from the Ural Mountains to Ireland, the people erected wooden figures, of them quite large, as the ice age known as the Younger Dryas waned and the people could move into new, now-forested, lands. And they kept on during so until more recent times. There are stories from the deep past we won’t ever hear with our ears, but that’s not to say we cannot hear them. Archaeology tells those stories, the ones that I think matter. The past I’m talking of is the one wrapped in skins and furs against the spiteful cold of the Younger Dryas. It has wise eyes and a hopeful heart; it knows what sustenance may still grow in snow and biting cold, and knows where the animals go to drink deep in parched summers. That past is carried in each and all of us, we are here because our ancestors survived the ice and cold with wisdom, courage and plain stubbornness. There’s times, however, something is found in bog, field or lake which beckons us to gather round in a circle, sit down, put the phone on silent, and listen to the past intently. The Shigir wooden idol is one such object. It is an enigmatic wooden figure which, I admit, I could spend days just looking at, and ‘listening’ to, for it must have such a story to tell of the people who made it. It was found in a peat bog (all the best things are, imo) 100km north of Yekaterinburg, Russia, at the end of the 19th century. It stands head and shoulders (literally) above other objects of the past as it would have measured around 5 m when complete, a tower of song, stories and memory set down some 11000 years ago. It is made of larch wood, and decorated with deep zig-zag lines on the torso, with 8 intriguing smaller faces carved as part of the design of the body. All the faces are unique and expressively stern. More idols and a bibliography at the link. I love a good bibliography. Read the whole thing! Proctor’s Ledge from the Walgreens parking lot, filtered by Dreamscope. Once there was a dirt road, the “Boston road,” that ran beside a pond on the way out of Salem. (Now it is called Boston Street.) Then there came a railroad, and a shoe factory, and today a Walgreens drugstore with the actual witch execution site in back, next to the drive-up prescription window. Why did no one know that? Watch this videotaped lecture delivered in October 2016 at the Salem Witch Museum by Prof. Baker and local historian Marilynn K. Roach. They point out that Sidney Perley, a Salem lawyer and antiquarian, worked out the answer in the early 20th century — they call him their “patron saint.” Key evidence: sight lines from known 17th-century houses from which people viewed the hangings: they could see Proctor’s Ledge but not Gallows Hill from there. For even more information, see Baker’s Gallows Hill Project website. The Proctor’s Ledge rock outcropping is in the wedge-shaped parcel between Proctor, Pope, and Boston streets. There are houses on Proctor and Pope, and much of the site is in residents’ back yards. The pink line is the crest of the ledge, roughly, and the blue dot the memorial site. North is at the top. There are no oaks on Proctor’s Ledge today (mostly locust), but in 1692 apparently there was a big oak tree with sturdy, spreading branches. No cost, just bring a ladder. Hence the sapling oak in the memorial?? Archaeologists crawled all over Proctor’s Ledge and used ground-penetrating radar, but they found nothing: no bones, no remnants of any structure. There had been a report of bodies dumped in crevices in the rocks, but if so, their families or somebody recovered them. And now some “woo,” since you have read this far. On June 25, 1914 a fire burned through the southern part of Salem, pretty much everything south of Derby Street. Eighteen thousand people were left homeless, and more than 1,300 buildings destroyed, many of them wooden tenements housing factory workers (shoes, textiles, etc.) Photo source here. Where did it start? At the foot of Proctor’s Ledge. 1. ↑ If archaeologists ever find it, they might attribute it to a Victorian-era visitor. That’s not a crystal athame. THAT’s a crystal athame.1)Pop culture reference: Crocodile Dundee. A year ago I posted about three athames that I own. One of them has a crystal in its hilt. About 4,000 years ago in what is now southwestern Spain, some group of people built an elaborate megalithic structure. At least 25 individuals were interred within the structure , along with “an extraordinary set of sumptuous grave goods…the most notable of which is an unspecified number of shrouds or clothes made of tens of thousands of perforated beads and decorated with amber beads”. Additionally however, a large number of crystal arrowheads were found together, which be suggestive of a ritual offering at an altar. . . . In the second chamber archaeologists found the body of a young male aged between 17 and 25 lying in the foetal position along with a large set of grave goods. These included an undecorated elephant tusk laid above the young man’s head, a set of 23 flint blades, and numerous ivory objects. Additionally, red pigment made from cinnabar had been sprayed over the body and the objects surrounding it. 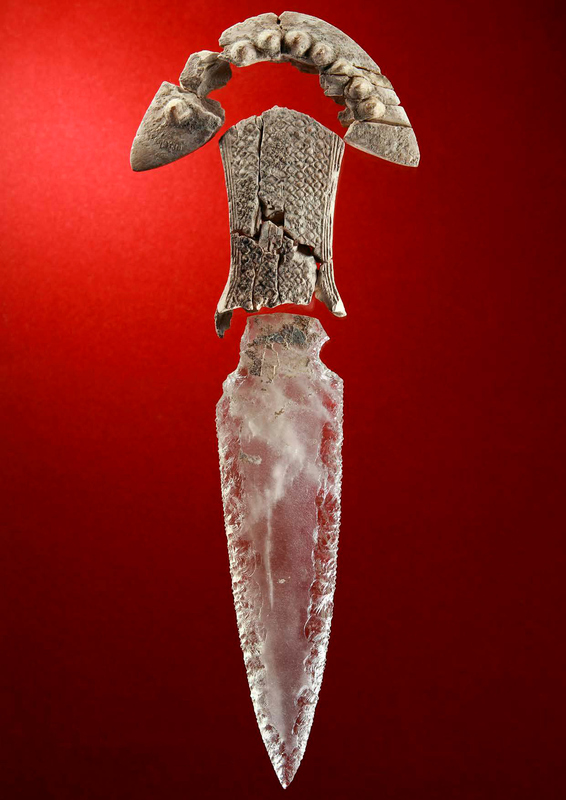 The “remarkable crystal dagger blade”, however, was not found with these grave goods, but instead in the upper level of this chamber. A sign of high status? A magical weapon? All of the above? There is a longer archaeological paper accessible here. Found in The Daily Grail, in the sidebar. 1. ↑ Pop culture reference: Crocodile Dundee. You want to go full old-time Pagan at the next festival? Rock the full Ötzi, like the original Ice-Ice Man his own self. It’s said that fashion is cyclical, and that the styles of past decades are inevitably revived for new generations. But for a truly original look, trendsters should dig deeper than the neon spandex tones of the 1980s or the flower child garb of the 1960s. Why not channel the tropes of an even simpler time, beyond the flapper-dressed Jazz Age and into the Copper Age, some 5,300 years ago? New DNA research shows you just what you will need: a little bearskin, some goat and deer . . .
Archaeologist Sarah Parcak in Newfoundland. (National Geographic). The discovery of Norse ruins at L’Anse aux Meadows, Newfoundland, in 1960 proved once and for all that the sagas were right: settlers from Iceland and/or Greenland came to North America. Now a new discovery on the other side of the island suggests even more of a Norse presence. But the clincher is evidence of iron-working, something no indigenous people did. Men came to Tollense . . . or whatever it was called about 3,260 years ago.1)“The things they carried” — an appropriate literary reference? In a river valley north of Berlin, two Bronze Age armies clashed, casualties were at least in the hundreds, and no one can say who fought or why. “We have 130 people, minimum, and five horses. And we’ve only opened 450 square meters. That’s 10% of the find layer, at most, maybe just 3% or 4%,” says Detlef Jantzen, chief archaeologist at MVDHP. “If we excavated the whole area, we might have 750 people. That’s incredible for the Bronze Age.” In what they admit are back-of-the-envelope estimates, he and Terberger argue that if one in five of the battle’s participants was killed and left on the battlefield, that could mean almost 4000 warriors took part in the fighting. It’s my literary imagination at work — someone must have sung those dead warriors, maybe in a long elegiac poem like Y Gododdin — but in what language? And to what ends? 1. ↑ “The things they carried” — an appropriate literary reference?